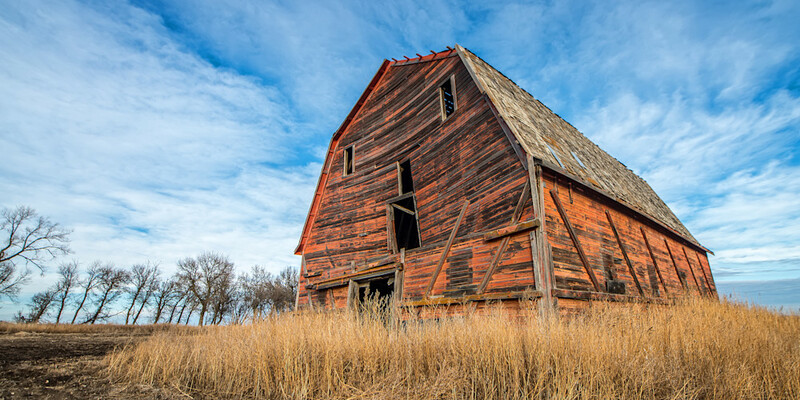 Spirit of Saskatchewan, this old red barn serves as a beacon of a time past in South East Saskatchewan. Available in a photograph print, canvas or printed on metal. It was an unseasonably warm December day for Saskatchewan. The temperatures were flirting with the melting point, there was a beautiful cloud cover, and the wind was at bay. It was a perfect day to explore for a candidate for my Abandoned series. I have drove by this barn countless times. In the Saskatchewan country a landmark such as this is as good as a street sign. No doubt directing countless travellers on their way. It has always spoke to me, however I have never really found a vantage point to my liking. Today was different. The still vibrant reddish orange of the barn wood stood proud on the horizon. The white clouds swirling into the peacock blue sky, as if whimsically brushed onto a canvas by a master painter. I depressed the button on my Nikon D800, and I knew I had captured it. The Spirit of Saskatchewan. An icon of agriculture, reaching into the living sky, a true trademark of the prairies.